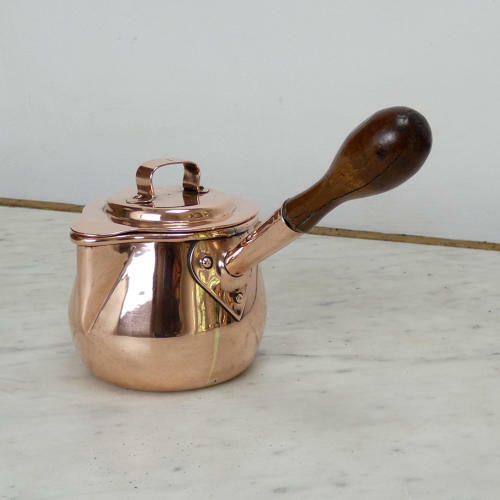 A small, Victorian copper saucepan and cover with a pouring spout and a wooden handle. This type of pan is often, now, referred to as a brandy pan but originally they were simple catalogued as saucepans. It is well made, from a substantial gauge of copper, and it has castellated seams around the base and up the side. The handle is turned from oak. The base is marked with the orb and cross symbol used by Benhams and the lid is marked '1'. This refers to the capacity as the pan holds one pint. It dates from c.1860. It is in very good condition but the tinning, to the interior, is worn.